One of the benefits of blogging that I am discovering is that it gets me out surfing other people's blogs and following links. Somehow, earlier this week I wound up on Jane Sassaman's blog. I was able to take a class from Jane about a year ago and her approach to decorative stitching has influenced me heavily. Some of my favorite stitches have come from her suggestions. The fact that she also uses Bernina and creates the amazing quilts that she does on a machine similar to mine really encouraged me to play. 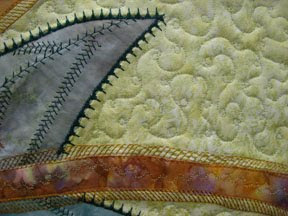 In Jane's current entry, Quiet Before the Storm, she shows how she transforms a piece of fabric into a most amazing quilted piece. Each figure in the fabric develops a personality - all through decorative stitching. It is really worth checking out. The stitches she uses are simple, available on most machines, it is simply a matter of considering how some stitching might make a piece unique. Hope you have time to check it out. Here is the link again. Thank you for the link to Jane Sassaman's blog. Her stitching is beautiful! How fortunate you've been to take a class with her.